In the final semester of architecture school, Matthew Abbott and Ryan Bloom participated in a traveling studio (Tall and Green: Seoul) sponsored by the Council on Tall Buildings and Urban Habitat (CTBUH) based in Seoul, South Korea. The design studio’s goal was to design a high rise based around a particular issue plaguing Seoul. After spending 8 days in Seoul with the class and professor, Matt and Ryan determined that their highrise solution would address the aging population of South Korea and the many issues surrounding the topic. Challenging the norms of highrise design, Noin Tap focused on the needs of the Korean elderly, innovative ideas in structure and experience, and more. 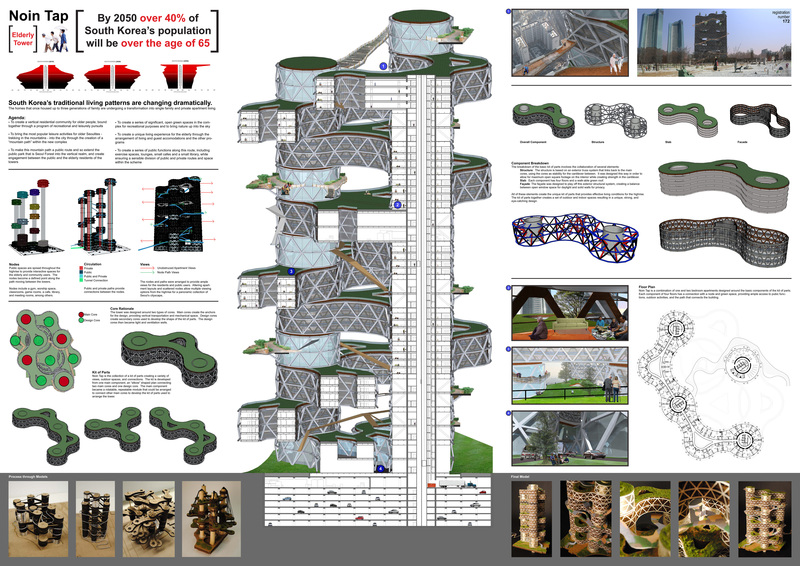 Recently, Matt and Ryan’s design was shortlisted in the CTBUH “Why Tall?” International Design Competition that concluded on October 12th, 2011 at the CTBUH National Conference in Seoul, South Korea, where their work was on display. Their work can be viewed below as well as on the CTBUH website (www.ctbuh.org) under Tall Buildings Academic and Student Work. The “Elderly Tower” seeks to provide a haven for the growing societal sector of elderly Seoulites who now live apart from their families. The project seeks to accommodate many of the activities enjoyed by the elderly in an environment which rethinks the traditional high-rise typology, and especially the popular Korean recreational pursuit of trekking on mountain paths – via a mountain path route which winds around and within the complex. Tags: architecture, competitions, CTBUH, highrise design, international design competition, Matthew Abbott, Ryan Bloom, Why Tall?